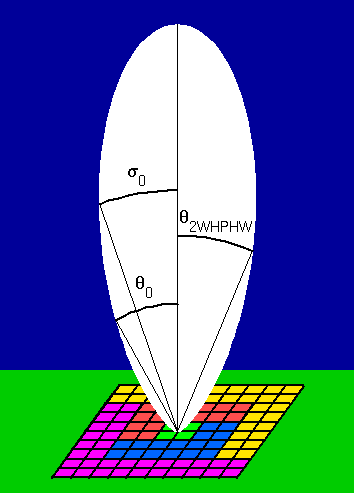 The polar diagram of the main-lobe for a wind-profiler radar beam typically has a Gaussian form. The beam width is inversely proportional to both the frequency of operation and the horizontal dimensions of the antenna; for a width of the order of a few degrees, dimensions of the order of 100 m are required for lower-VHF radars and of the order of a few metres for UHF radars. The different conventions for describing the beam width are described below. In order to reduce the side-lobe levels, it is common to use an antenna array which allows the transmitted and received power to be tapered off away from the centre. This is illustrated for the case of the NERC MST Radar's antenna array which is composed of a 10 × 10 grid of 'quads' (each quad being composed of a 2 × 2 sub-grid of 4-element Yagi aerials); the division of the antenna array into quads has an additional significance in terms of beam steering. Equal power weighting is given to the central section of 4 quads (green), the two middle sections of 16 quads each (red and blue), and the two outer sections of 32 quads each (yellow and magenta). In the transmit mode, each of the five sections is connected to a separate 32 kW peak-power transmitter. This description of beam width is required for correcting (standard deviation) radar return spectral widths for the effects of beam broadening. Note, however, that the spectral widths in the existing files of NERC MST Radar data are defined in a non-standard way; the values must therefore be multiplied by a scaling factor of 1.25 (explained in the file format page). The NERC MST Radar has a one-way half-power half-width of 1.5°, i.e. 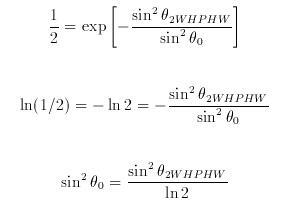 sin2σ0 = 2.47 × 10-4. Boundary-layer wind-profilers tend to have one-way half-power half-widths of the order of 5°.